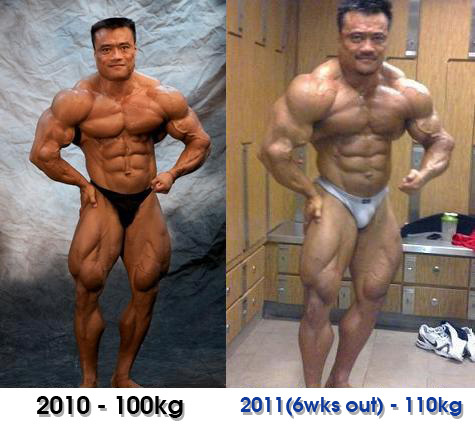 I have been training extremely hard for the upcoming WBPF Asian Bodybuilding Championships on the 7th Oct 2011 in Bangkok. For the past 1 year i breathed bodybuilding paying close attention to training, nutrition, recuperation and supps. Its a 24 hours 365 days thing and and all my hard work paid off handsomely as i have brought my physique to another level as shown by the pics. My physique mutated and managed to put on 10 kg of solid muscles in a year! I am looking forward to competing with the best bodybuilders in Asia in Bangkok and battling with the world's best 5 weeks later on the 12th Nov 2011 in Melaka. Yes, Malaysia is hosting this year's Mr. Universe and i will try my very best to bring glory to my country. To me its nothing but total focus on these 2 contests for the next 10 weeks. Cant wait for the BIG DAY! Cheers!